Combining Molinari Sambuka with a trial sized Monin Raspberry Syrup was easy with Do-It Corporation’s patented* billboard hang tab. 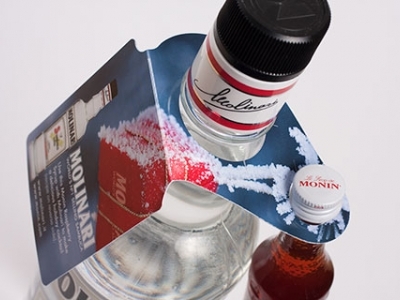 Digitally printed on both sides, the bottle neck hang tab slips easily over the caps and holds the sample securely in place. This provides an attractive way to get your product noticed in the store.